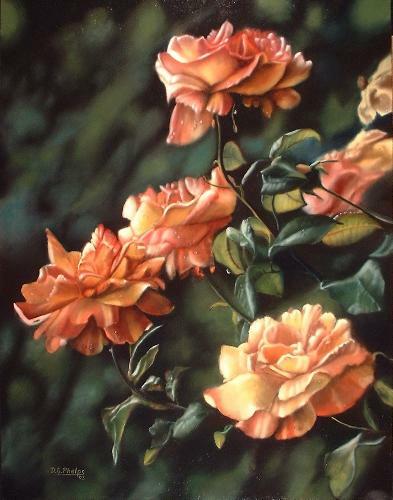 This wonderful example of a Hybrid Tea Rose Picture with an art lesson to show how it was created. Using the classical flemish layered technique, below you'll find the umber under layer and the dead layers. On the other page, you'll find the color layers. Here I've already completed the canvas prep, pencil and ink drawing, imprimatura and first umber underlayer painting. 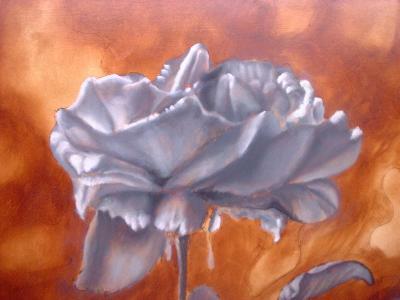 I have also completed a 2nd umber layer to darken the bottom left of the canvas. In this part of the painting, I have opted to take a shortcut. 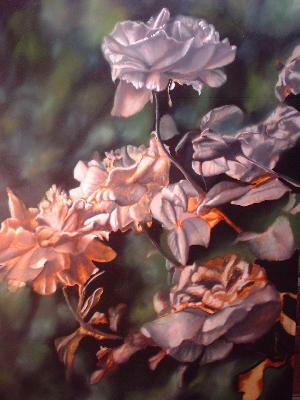 I've utilized the dead layer only on the blossoms and leaves due to the background going to be muted colors and out of focus. Here are the two left hand blossoms. Notice no texture or great details, only half tones and shadows. 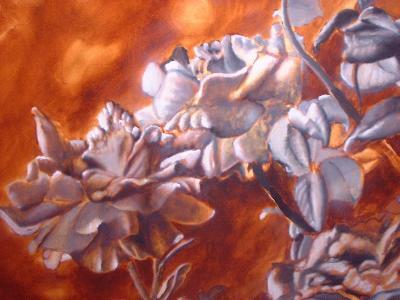 Another blossom up close to show the amount of detail that is usually enough to be ready for the color layers. 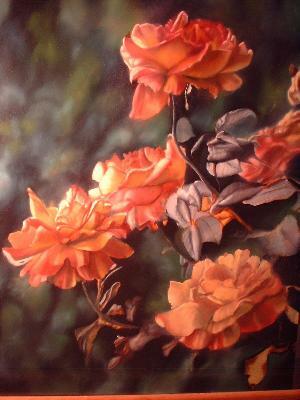 You made it to a Rose Painting Demonstration part II. 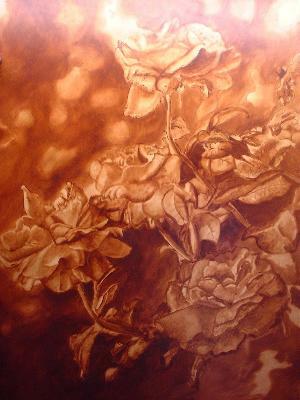 Here are photos of the color layers, and the finishing layers of this magnificent rose. Here I have begun coloring in the blossoms. The background has already been brought in and after paint has been applied, the use of the blending brush and small mop dry brush until the colors are muted and very soft. 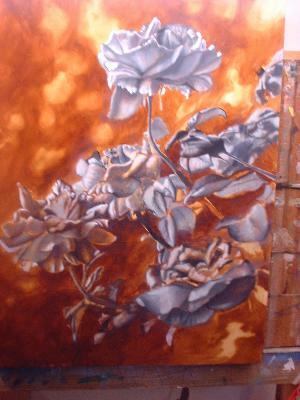 No hard edges keeps the background out of focus so that emphasis is brought to the roses. We came across this rose on a trip to the Niagara Falls on the Canadian Side. They have a rose garden that rivals anything I've seen here in the U.S. and England. And the Brits can grow some roses! The mist from the falls keep a constant dew on the pedals and made for some fantastic reference material. Should you ever go there to see them, I do recommend seeing the Canadian Side and the many attractions there!